A new manicure can cure melancholy, just like a new hairstyle. 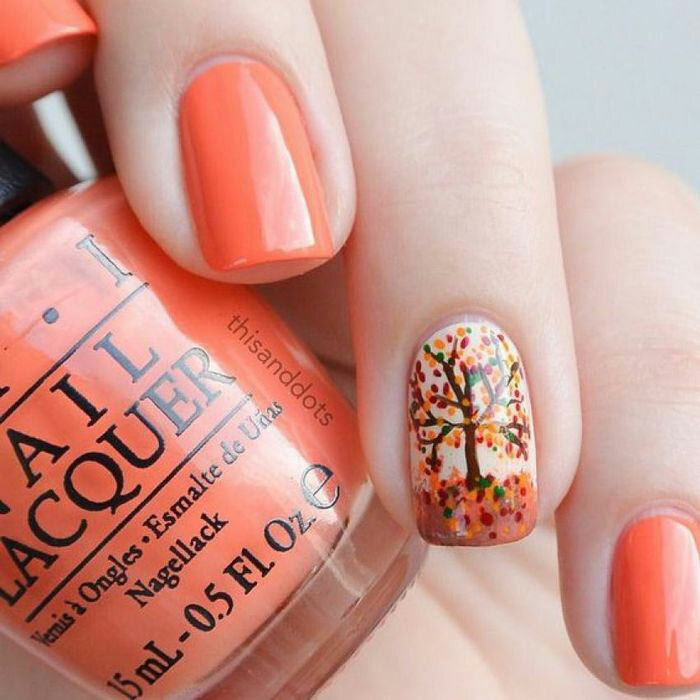 Several beautiful nail polishes can lift the spirits, create a fashionable image and even help surprise others. What colors to choose for the current season and how to decorate your nails? We have made an overview of the most interesting and brand new ideas! Pastel shades are the most fashionable this autumn-winter season. They are part of interiors, clothes and shoe collections. Therefore, they cannot be ignored when creating a manicure. Pastel colors are versatile and match any style of clothing, creating a very harmonious touch. You can use several different shades matching each other well. 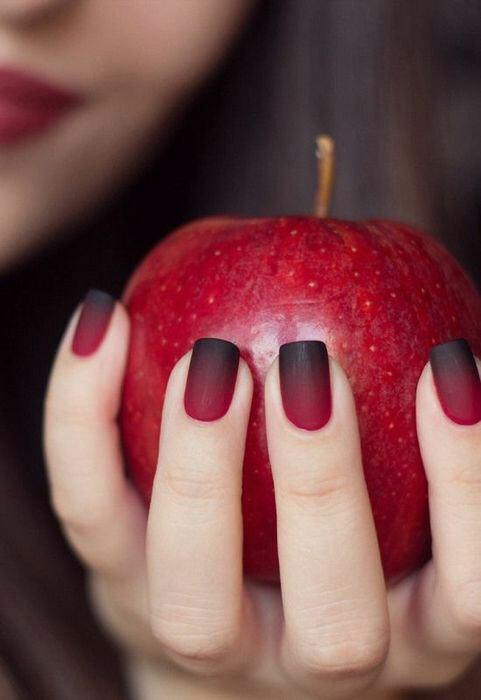 Matte nails not only look unusual, they are able to give the image a touch of mystery. An Ombre style manicure looks particularly impressive. In the autumn-winter season, pay attention to velvet burgundy shades. 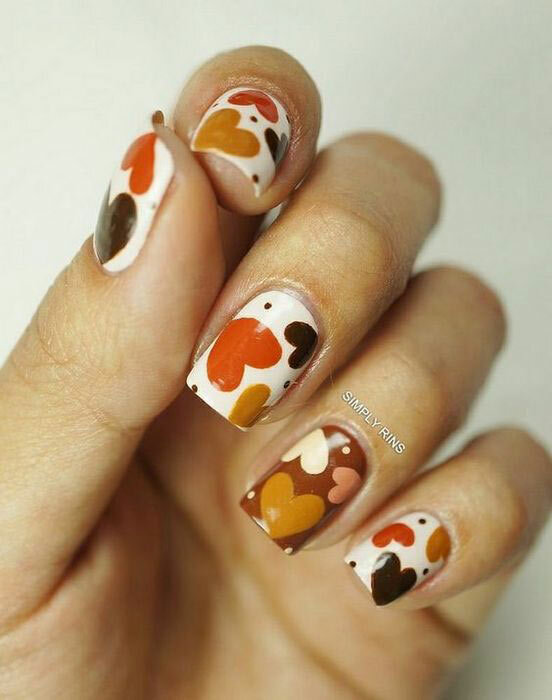 Hearts is a versatile print suitable for any time of year. In summer, they can be bright, while calm colors are perfect for autumn and winter. Therefore, paint the hearts brown, ochre or mustard. This manicure will be a great addition to a light romantic image. 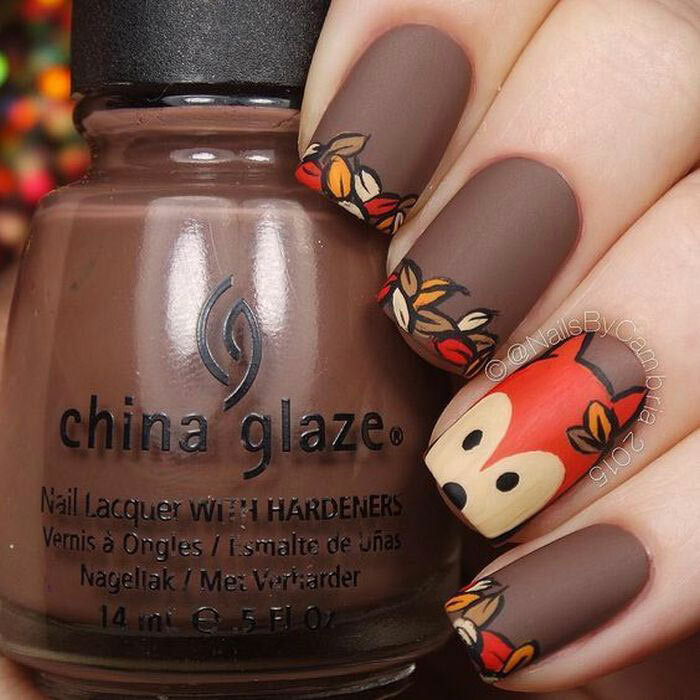 The Fox is considered one of the symbols of the autumn, thanks to the fiery color of its fur. 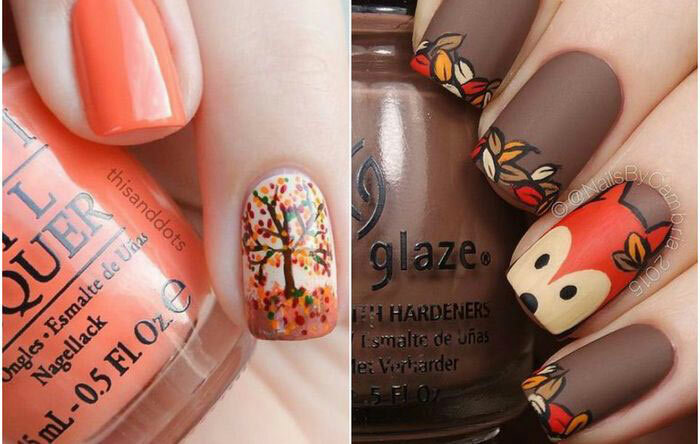 Nails depicting the animal’s muzzle, its silhouette or footprints look really unusual. 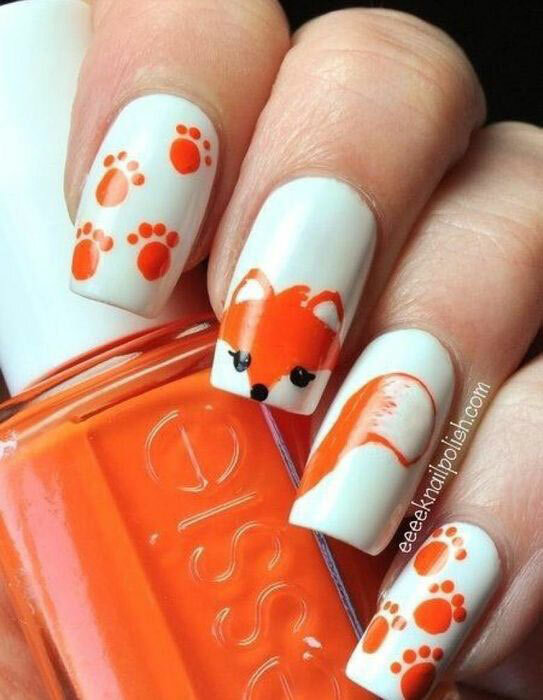 Of course, to paint your nails like this, you have to work hard, probably watch several video lessons. However, the result will delight you and raise your spirits on a cold autumn or winter day. What patterns to choose for the best effect? 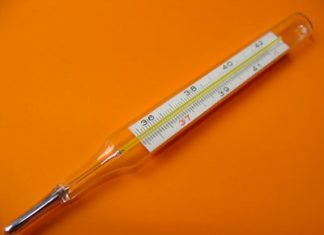 Experts advise contrast color schemes – brown/orange, white/orange. One of the most common autumn motifs is yellow leaves. You do not have to paint all your nails like this – it is enough to make a nice accent on the ring finger. 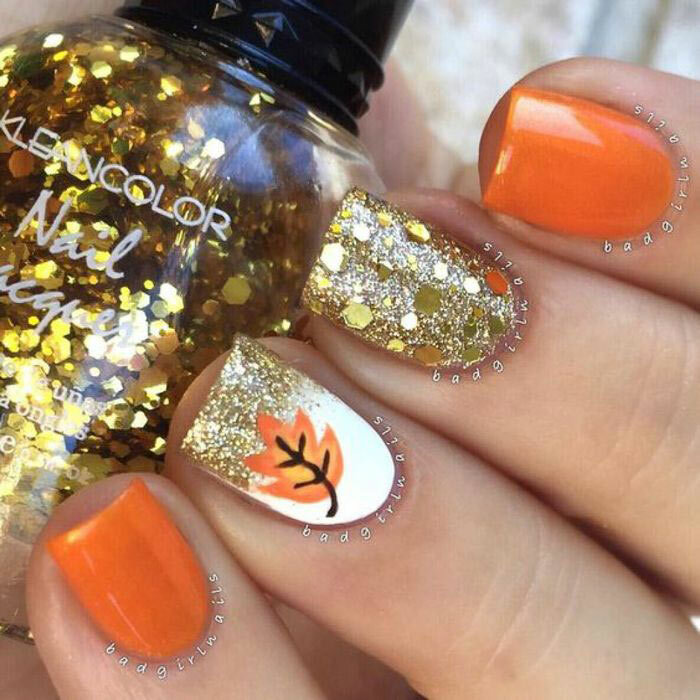 Other nails can be covered with a neutral nail polish and glitter. Then, you will achieve a beautiful glowing effect. It is best to choose a nail polish and glitter of warm shades. If one leave is not enough, try to draw the whole tree. It is very easy, if you have a thin brush. Sometimes you are lucky to find nail polishes with such brushes in stores. But it’s easier and faster to paint a tree with acrylic paints, and then fix the artwork with a transparent nail polish. 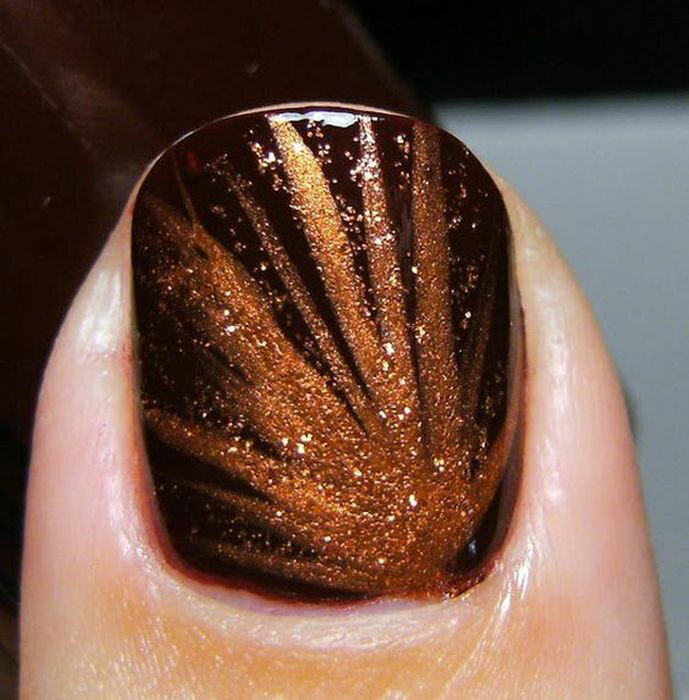 The combination of dark and golden or bronze nail polishes looks very festive. 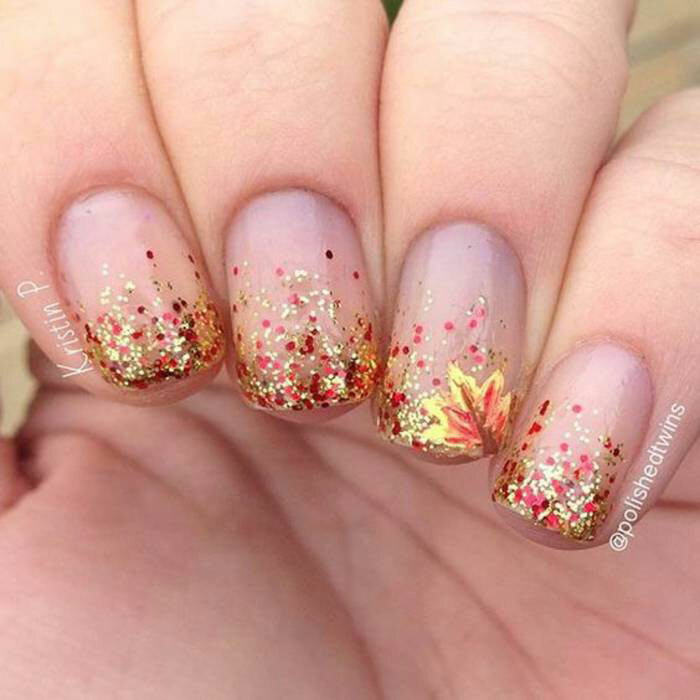 This manicure is suitable for a night out and will look perfect at any celebration. It is quite easy to create, the main thing is to get a few contrasting colors, one of which should have a metallic luster. The unusual black French manicure is trendy this autumn and winter because Gothic style is very popular now. Such manicure should be done very carefully; the nails should be beautiful and well groomed. It looks best on medium-length nails. 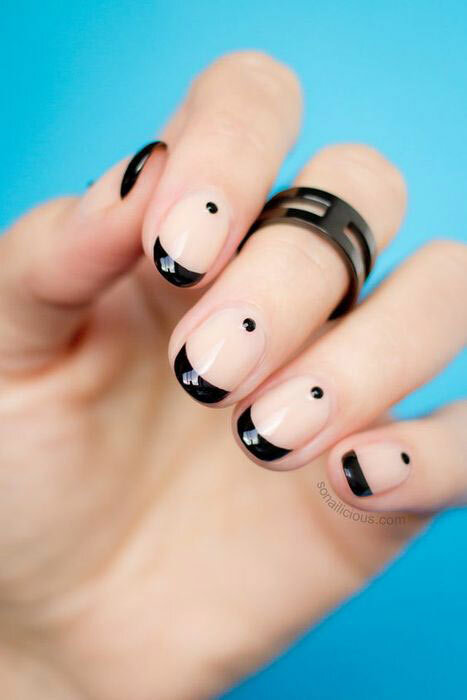 To complement such a manicure, paint a few black droplets on the lunula to make an accent.